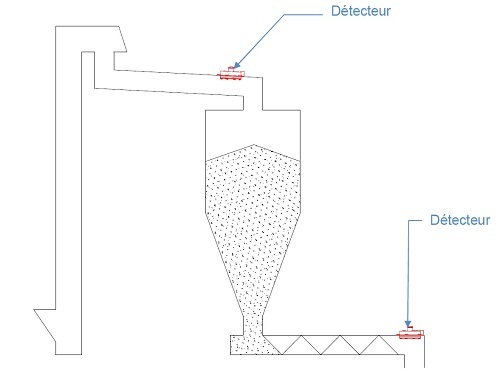 Principle: Level and packing detectors are simple, inexpensive instruments for checking the levels of loose products in silos by starting or stopping the supply systems. They consist of a cast-aluminium housing, provided with a flexible steel or neoprene membrane. They are used to check the minimum and maximum levels of loose, powdery, granular or dusty products. Their robust construction allows them to be used for densities from 0.3 to 2.5 tonnes / m3 and for particle sizes of up to 30 mm. The controller has highly reliable operation, as long as the products are distributed on the surface during filling and the angle at the base of the cone is large enough for the pressure exerted on the membrane to allow the contact to switch. The level detectors can be used for a broad range of products. - It may be enough to install a single detector when only one indication needs to be obtained (minimum or maximum level). In this case, the sensor lights up an indicator or triggers an acoustic system or any other electrical device. - When controlling any supply system of the hopper, the use of a single detector will, due to the sensitivity of the device, cause excessively frequent fluttering of the control contactor, leading to constant starting and stopping of the facility. In this case, it is advisable to use two detectors for controlling the top and bottom levels. Applications: Their robust construction allows them to be used for dry, fine or powdery materials, as well as for granular materials such as sand, gravel, coal and others, as long as they are no larger than a walnut. Mounting: Mounting by hanging inside the hopper by a 20 x 27 tube. A tapped boss is provided for this purpose. Mounting recessed in a hole of the wall of the hopper or silo; the diameter of this hole is shown in the diagram on the next page. Sensitivity adjustment: These equipments are adjusted at the plant. However, they may need to be adjusted slightly after installation. 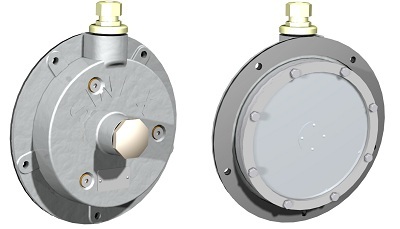 In this case, the raised plug is removed from the rear of the detector, and the sensitivity is increased or reduced by tightening or loosening the adjustment screw.